Happy New Year....may 2018 be kind to all of us. On to the first Sparkles Christmas Challenge of 2018. This challenge was picked by Jane and she chose White on White, which by the way is one of my favorites. I think white on white always looks so classy. My card is 6x6 I used a Stampin Up embossing folder and also the sentiment is from Stampin Up. The globe is Tim Holtz. I have to say I was a bit worried when I bought it thinking maybe all those little pieces would be a pain to get out....but to my surprise, they fell out easily. 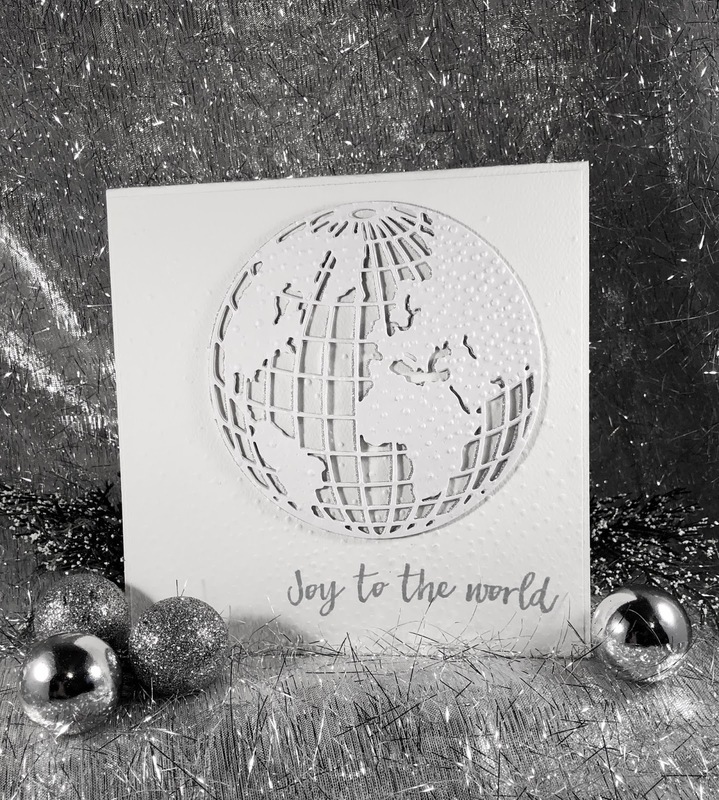 I also ran the cut die through the embossing folder to give the continents a bit of texture. I cut the globe 4 times in white and once in silver. The silver piece was placed a bit off to give the globe a little sparkle pop. Will I make a zillion of these? Probably not, but I plan to use this die often throughout the year. I'm off for now. See you here in February for a new challenge. Until next time, Happy Crafting take time to enjoy a part of each day of 2018. What a perfect New Year card this is. Wishing you Heslth and Happiness. Hugs Mrs A. Thank you....this is a fun card to make and easy too. Happy new year Mary what a gorgeous card and your design is wonderful. Happy New Year to you also. This was fun. I think I’ll be using this die often. Thankyou for my card that arrived today. Hugs Mrs A.